A body has been found in the search for a student who went missing after a night out. 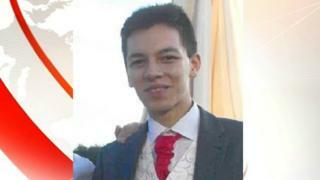 Ian Tang, 20, from North Walsham in Norfolk, vanished while walking home from Club KA in the town in the early hours of Sunday. About 200 people gathered to search for him at 10:00 GMT and police said the body was found just over an hour later. Police believe the body is that of the Norwich City College student but formal identification is yet to take place. Ch Insp Wes Hornigold, of Norfolk Police, said the death was not being treated as suspicious. However, investigations are continuing into the circumstances. "Ian is very popular with his friends, with the community... that is borne out by how many people turned out," Ch Insp Hornigold said. "I've been absolutely overcome with the amount of people who came to the police station this morning - probably over 200 people. "At this horrendous time, our thoughts are very much with Ian's family." The body was found on Mundesley Road by a member of the search party near the village of Swafield. Friends of Mr Tang, who worked part-time at a local gym, said he was offered a lift home from the club but he decided to walk back alone, leaving just before 03:00 on Sunday. He was last seen on the B1145 Mundesley Road on the outskirts of the town between 05:45 and 06:00.